When new calves are born at Soaring Eagle Dairy, they are moved to a calf barn where they are fed pasteurized cow milk 2 times each day. They also receive grain and water to keep them growing and healthy. Then from 2 – 5 months of age they move to a group housing barn where they get to eat, sleep and play with other calves their age. They are fed grain, water and a special mixture of feeds to prepare them to become milking cows down the road. 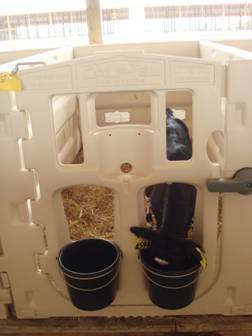 When calves reach 5 months of age, they are off to sunny Colorado. 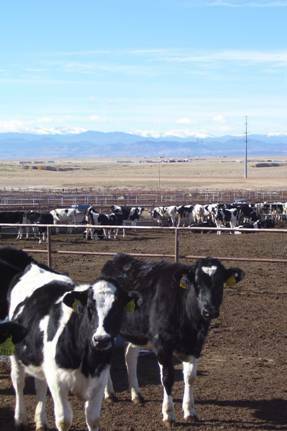 Soaring Eagle Dairy is a partner in a dairy heifer raising facility in Carr, CO called The Heifer Authority. This business specializes in raising top quality animals that are ready to return to their home farms and become dairy cows. Colorado was selected for the location of this operation due to its warmer, sunnier and drier climate. 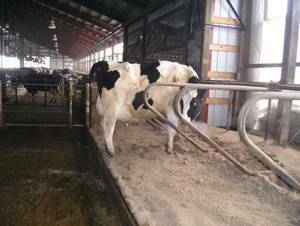 Once the animals reach approximately 2 years of age, they return to Wisconsin and become milking cows, just like their mothers before them. Cows are milked three times each day. Cow comfort is important to the dairy and has led to the installation of a mist cooling system, rubber flooring and long day lighting. Sand bedded free-stalls were retrofitted into existing barns in 2004. All cows are bred AI after a 75 day waiting period and are dry for 45 days prior to freshening. A mixed ration of corn silage, haylage, corn, cottonseed and corn gluten are fed to the cows.